Ilayathalapathy Vijay hosted an event today to honour his initial producers, who helped him get the introduction he had. He invited the producers ‘Vasantha Vaasal’ M Rajaram, ‘Rajavin Parvayile’ Soundarapandian and ‘Once More’ CV Rajendran and presented them with a cheque of Rs 5 lacs each. Mr Balaji Prabhu, the son of late producer M Baskar, who produced Vishnu and Mrs. Shantha, wife of late KRG, the producer of Minsara Kanna also were the recipients of Vijay’s love. “I wanted to do this in my office but my manager, Selvakumar forced me into hosting this event,” Vijay said. He summed up saying, “Success reaps happiness, whereas, failures offer experiences. With this thought, I wish all the producers the best of luck.” He also wished that more such events happen in the coming days. 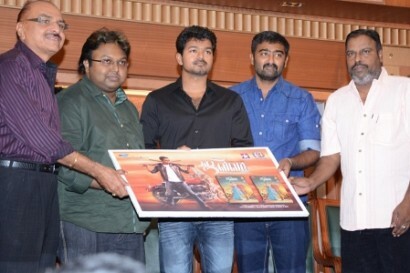 However, the surprise of the evening was the Jilla team, including producer RB Choudary, director Neason and composer Imman, along with the hero of the evening, Vijay, also launched the music of their movie amidst the presence of the other producers. Talking during the event, Imman recollected that it was Vijay who introduced him and thanked the team for giving him an opportunity to work with the star again. Neason was equally grateful for the opportunity and expressed his happiness over working with Vijay and Mohanlal in the same film. The formal audio launch will happen on 21st December 2013. What does the Jilla album have to offer? This page has information about Ilayathalapathy Vijay sets an example, Ilayathalapathy Vijay, Jilla.